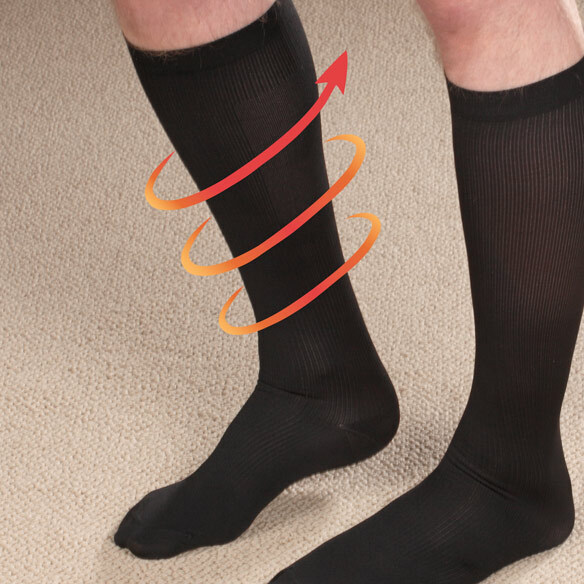 Our 15-20 mmHg men's compression socks help reduce fatigue, swollen ankles, varicose veins. Nylon, Lycra®, spandex is machine washable. USA. Being on my feet for 8+ hours, these socks truly help. I bought these socks for my husband. He wears them every day and says they are most comfortable. He has worn compression socks socks for years. He says these are the best. These compression socks have worked out perfectly for me. These compression socks are not only stylish, they are comfortable and afford the perfect amount of compression to keep my legs from swelling while sitting for long periods of time such as driving or flying. I use these to help with swelling in my legs due to circulation problems. The work well and look great. My husband is a large man, so we ordered the largest size available. He couldn't even get them up over his heel. Very disappointing. We were hoping for something at a lower cost than the compression socks we get at the local Medical Supply store. This was a waste of our money. Needed additional socks for trips. Love compression socks as I work long hours on airplanes. Needed for support because of diagnosis of congestive heart failure. Trying a different brand that's less expensive. They really help eliminate cramps in my feet and legs after dancing - I Square and Round Dance.. I also occasionally take a tea spoon of mustard to avoid having charley horses in my legs after dancing. To wear under my slacks in the cold weather. Need them for the swelling in my legs, but want to try a pair that may be a hair more comfortable at times. Dr. says that I will get better circulation and it will slow the development of vericose veins. A friend of mine has an edema problem. They are at a lower price than i have found and hope they work for my swollen legs. I ordered these socks for a friends who is having major feet problems. DR WANTS HUBBY TO WEAR THESE, SO I GOT FROM YOU. Good price -purchased before and very satisfied. My husband needs compression socks because he stands all day at work on concrete floors and his legs hurt him all the time.he has had compression socks before and it really helped him and I wanted to purchase more for him. He wore the others completely out! Bought 2 pair a month ago and love them, they are lite weight and easier to get on. I bought these for my husband, whose feet, ankles and legs are hurting after standing on concrete floors all day. I've bought a sampling of compression levels so he can see what feels best. Dr. recommended it for my husband. What's the calf width on medium size? BEST ANSWER: Thank you for your question. The calf circumference, unstretched, is 7 ¼”. We hope this information will be of help to you. do you have extra wide calf sizes? BEST ANSWER: Thank you for your question. 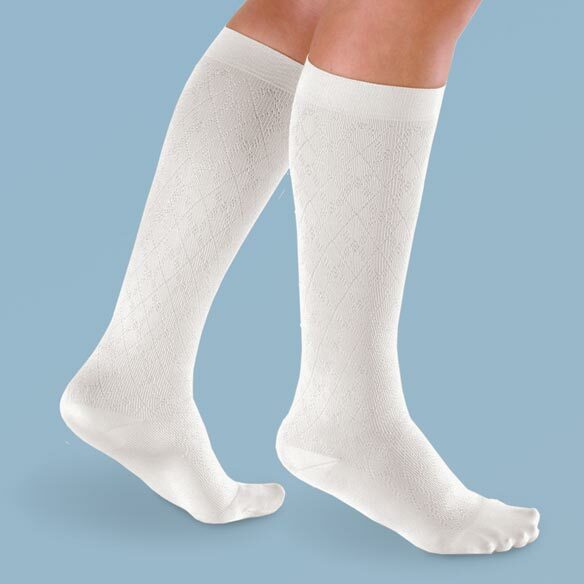 Unfortunately we do not sell any extra wide calf socks. We hope this information will be of help to you. I need compression socks up to my knee,will these work for that? BEST ANSWER: Whether these socks will get up to your knee depends on how long your legs are. But know that there's a drawback to the socks going all the way up to your knee: they will rub against the tendons/ligaments on the back of the knee, which doesn't feel good, and might do its own damage. Let them be an inch below the knee. It may depend on what size you buy and your leg dimension. Also, whether you want the stocking to go up to the knee or go over it. You can call easy comforts and find out the return policy. Then, I suggest you buy one pair and see how it fits. You can then determine whether you want additional stockings. You need to ask your doctor what compression you need? example 23-32mmHG 30-40mmHG etc. Yes these socks work very well for that.?? What compression are these socks? BEST ANSWER: Easy Comforts doesn't know, so I called the seller in Utah (+MD USA LLC) and she couldn't find an mmHg rating. Who knows? I plan on wearing these for a few weeks and then checking my legs myself and have my doctor check them too. Sorry, I messed up because I didn't realize the question was about a different pair of socks, not the Ribbed. These socks are 15-20. What is the actual size at the ankle and calf on the XL? BEST ANSWER: Thank you for your question. The size of the ankle is 6 1/2" and the calf is 18". We hope this information will be of help to you.